Since The Washington Post ran a slideshow of “shocking” photos of Olympic unpreparedness in Sochi early this week, I’ve been increasingly grumpy. Western reporters landed in Russia’s little slice of paradise on the Black Sea and immediately began complaining about everything around them. Some of their anecdotes and observations were funny- I couldn’t help but smile at poor translations on menus around town, which I myself enjoyed while cavorting around Russia- but others just seemed like they were coming from inexperienced travelers with little knowledge of Russia. …That, or whiny teenagers. I, along with many other Russophiles, have reached my breaking point. Is there a sign asking you to throw your toilet paper in the trash can, and not in the toilet? Again, pretty normal. See above re: pipes. They can’t handle the massive wads of Charmin Ultrasoft you like to use, let alone how much rough Russian toilet paper you’ll take to compensate. You should really just be thankful that you have “Western-style” toilets, because – gasp! – squat toilets exist in countries outside of the United States, including Russia. Awwww, your hotel bed’s a single bed? Are you feeling a little claustrophobic, or was your plan to bring a Russian hottie back to your room for some alone time suddenly foiled by reality? Every European hotel I’ve stayed in (except one) has had tiny, single beds. The construction of your hotel probably evicted a bunch of Sochi residents from their lifelong homes, so at least you have a roof over your head. If you are going to bash Russia, please do it for things it deserves. Maybe because you are against Russia’s treatment of gays, or because you worry about Sochi’s environmental implications. Don’t make fun of an entire country because you have no travel sense or moral standards. I, for one, will treasure my memories of Sochi from my trip there, and I’m totally amped to watch the Opening Ceremonies tonight. Is the Russian Trade War Ukraine’s Golden Ticket to the EU? A Creme-Brulee Roshen bar, via flickr user schoko-riegel. If Russia places an embargo on your country’s most popular edible exports, chances are the Kremlin is none too pleased with you. Moscow’s most recent political collateral is Ukrainian chocolate, banned from the Russian market July 29. This week, Russia stopped importing Ukrainian goods almost entirely. After claiming to find traces of the carcinogen benzopyrene in the Ukrainian sweets, Russia’s consumer standards agency, Rospotrebnadzor, stopped import of chocolates from Ukraine’s infamous Roshen company, which garners about $40 million in profit from the Russian market per year. The confectioner’s other top markets–Moldova, Tajikistan, Kyrgyzstan and Belarus–continued to import the chocolate, however, as they found no evidence of carcinogens. In the past, Russia’s political disagreements have sparked embargoes on Polish meat (Russian babushki could only dream of Polish kielbasa from 2005-2007), Belarusian dairy, and Georgian wine (happily returning to the Russian market this year). Ukraine, however, was not lucky enough to escape with only one affected market. Yesterday, Moscow launched what many are describing as a full-on trade war against Kyiv. All Ukrainian goods have been labelled potentially dangerous, and are subject to lengthy inspections before crossing the border into the territory of the Eurasian Customs Union of Russia, Belarus, and Kazakhstan. As Ukraine’s economy is heavily reliant on exports, 23.7% of which go to Russia, this is a serious issue for Kyiv, but not entirely unexpected; Moscow’s seemingly drastic actions are intended to pressure Ukraine into shunning the EU’s offers of Free Trade and Association Agreements in favor of beefing up its ties with Russia and joining the Eurasian Customs Union. It’s a poorly thought out move on Russia’s part. Though the cessation of Russian exports could be devastating to Ukraine’s economy, Russia’s bullying might finally inspire the EU to decisive action; Ukraine has had a less than stellar reform record and has done little to curry favor with Brussels, so hopes for an association agreement at the Eastern Partnership’s Vilnius Summit this fall were murky at best. But Russia’s pressure on the Ukrainian economy–not to mention the obvious motivation behind it–has a chance of awakening the EU’s hero gene, which has played a decisive role in the dissipation of regional conflicts in Georgia, Belarus, and Ukraine itself in the past ten years. The Russian government’s short-term memory is shockingly bad; its economic strong-arming was one of the major causes of the Orange Revolution. This time around, the EU has the bureaucratic structure (the EaP) and a few well-respected pro-Ukraine cheerleaders (Poland, Sweden) that will look past Ukraine’s failings and use an Association Agreement as a shield against an increasingly aggressive Russia. It seems that among its “carcinogenic” chocolate, Ukraine has found its golden ticket to the West. The pressure is on for Obama to cancel an upcoming meeting with Vladimir Putin over Russia’s granting of asylum to NSA whistleblower Edward Snowden. In Congress, representatives of both parties including Chuck Schumer (D-NY) and John McCain (R-AZ) are calling for the White House to pull out of the meeting, at the very least, while others call for more serious repercussions. Were Obama to concede and cancel the meeting–which he seems to be seriously considering–the move would be nothing short of diplomatic child’s play. Russia, like a bully on the playground, has stolen something we want while we had our backs turned. It won’t share! So now we’re giving it the silent treatment. Ouch. But the diplomatic silent treatment won’t work here. One of Russia’s foreign policy priorities is to bolster its image as a major world player; Putin doesn’t really care if the US shows up for a meeting at which, most likely, no compromises would have been made and nothing would have gotten accomplished. And what does it say about the United States that this is the issue we move to “extremes” over? We could have reacted as sharply when Russia unceremoniously booted our USAID mission from the country last fall. Or over concerns about the upcoming Sochi Winter Olympics. Or–perhaps most importantly for the winner of the Nobel Peace Prize and supposed gay rights “champion”–as disturbing trends emerge in the wake of Russia’s anti-gay law. Instead, we’re most concerned about the fate of a twentysomething who caused us some embarrassment on the international stage. Whose image image needs bolstering now? On Thursday, June 27, the Center for Strategic and International Studies hosted a discussion on the security concerns surrounding the 2014 Sochi Winter Olympics with Sergei Markedonov, a visiting fellow with CSIS’s Russia and Eurasia Program. Markedonov presented his main concerns regarding the security of the Sochi Games, launching in just seven months. I was lucky enough to spend a week in Sochi in 2010, as Russia began its preparations for the Games. The gorgeous mountains, seaside, and Olympic propaganda plastered on every billboard revealed little of the region’s precarious geopolitical position and fraught ethnic history. Of course, I dug deeper, both during my trip in interactions with locals and as a graduate student. What follows–I hope–is a digestible primer on the issues surrounding the 2014 Winter Olympics, based on my own knowledge and views presented by Markedonov. 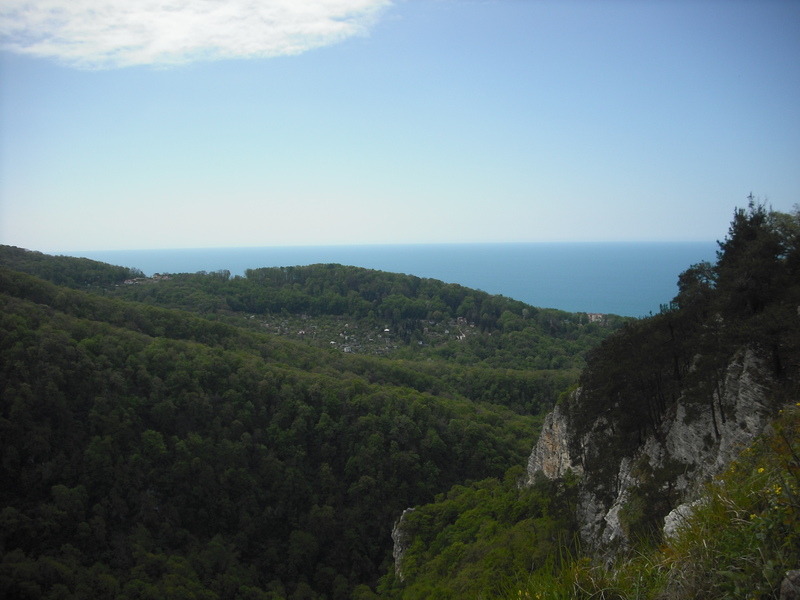 A view from a mountain near Sochi, looking down on the town and sea below. Sochi is located between the Black Sea and the famed North Caucasus mountains (the range where the Ancient Greeks thought Prometheus was chained to his famed rock). 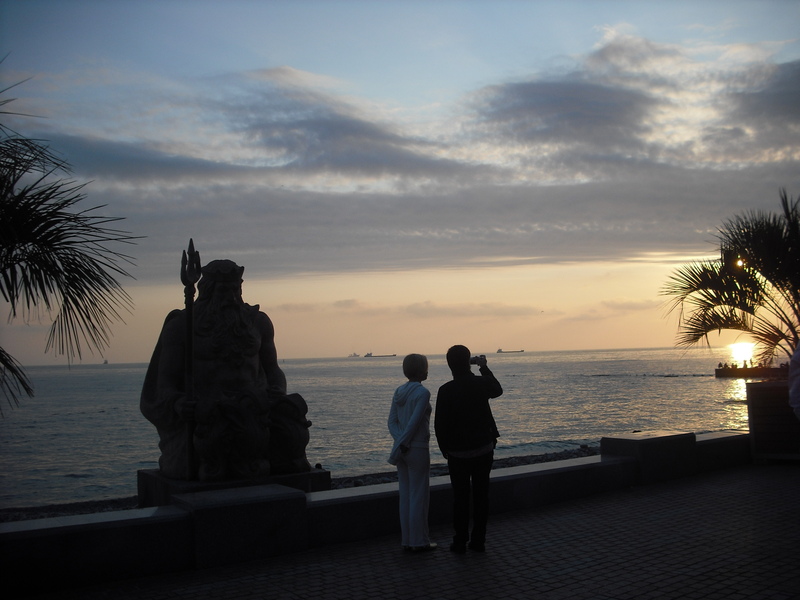 Sochi was enveloped by the Russian empire in the late 19th century after the Caucasian War, and since then, it has developed the reputation of Russia’s “Summer Capital,” where good Russian and Soviet citizens–the last Tsars, Stalin*, and Putin among them–flock to get their fill of sea air and sunbathing. That’s what you’d find on the back of a postcard, anyway. Markedonov has a different view of regional geography: he finds Sochi’s proximity to instability paramount. The city is situated just 200 kilometers from the Russian republic of Kabardino-Balkaria, which Markedonov cited as the third most active terrorist zone in Russia. While terrorist activity in the North Caucasus region has declined in recent years, a Dagestani militant group has openly threatened the 2014 Games. The causes of these protracted conflicts are varied and impossible to pinpoint, yet all have at least a shade of nationalism at their core. The Caucasian War, which brought more than 50 indigenous ethnic groups into the Russian Empire largely against their will, fomented these nationalist feelings. The end of the war was sealed with the forcible expulsion and eradication of one of the ethnic groups–the Circassians–from the region, referred to by many academics, human rights activists, and anti-Russian governments as the Circassian Genocide. The Circassian Congress claims 400,000 ethnic Circassians were killed, while 497,000 were forced to migrate to Turkey, leaving only 80,000 ethnic Circassians in their native lands at the end of the Caucasian war. 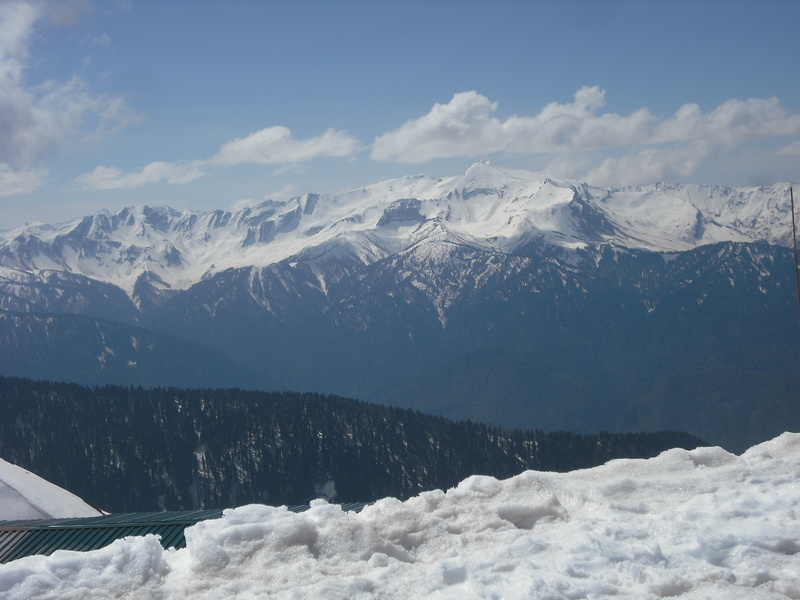 The snowy peaks of the North Caucasus, taken near Krasnaya Polyana, Putin’s favorite resort, where some Olympic events will be held. On top of terrorism and genocide, Sochi is also in close proximity to the international conflict between Russia and neighboring Georgia, which resulted in armed conflict in August 2008. Since the Five Day War, the disputed territories of South Ossetia and Abkhazia, which fall within Georgia’s borders, have become de facto Russian republics, cut off from Georgia and its government. Russian-Georgian reconciliation has been essentially non-existent; until Bidzina Ivanishvili was elected as Prime Minister last fall, the Georgian government threatened to boycott the 2014 Games. And who can blame them, with threat of terrorism, the ghost of genocide, and ongoing international disputes surrounding the host city? With seven months before the opening of the Games, Russia has some scrambling to do to improve Sochi 2014’s image at home and abroad. Markedonov posited that with “creativity in public relations” and “a high standard of security service and inter-ethnic understanding,” the 2014 Sochi Winter Olympics might just get off the ground without incident. Russia, of course, cannot afford “incidents.” The Games are of symbolic importance to the country; being the first held in Russia since the fall of the Soviet Union, Markedonov believes they represent Russia’s return to the “major leagues” of international policy. I have no doubts regarding Russia’s ability to create a physically secure environment for Sochi 2014. They’ll just send in rows of OMON–riot police–like they have for years. Add a few security checkpoints, no doubt ethnically targeted, and the event will be secure in Russia’s eyes. But public relations and inter-ethnic understanding have never been Russia’s strong suit, and the very security precautions taken in 2014 may simply provide new fodder for old conflicts. A statue of Neptune overlooking the Sochi boardwalk. *Interesting fact: Stalin had a summer house in Sochi, complete with bunker and underground tunnel to the shore. You can visit it when you’re in town for the Olympics.